Mindful Mothers and families gathered at SLO Creek Farms on Saturday, November 3 to “glean” apples. It was so cute to see the little ones picking apples, running, playing, and of course eating apples in the orchards! We harvested apples for just over an hour and picked 457 pounds of pesticide-free apples that were distributed and enjoyed by Food Bank recipients the following week. Thanks to those who volunteered to help feed the hungry in our community! This was an opportunity to talk to our little ones about how we can pick fruit to share with our neighbors in need. Bank. They also let us take home as many free apples as we wanted to pick! Thank you, Gables! GleanSLO is an effort under the Food Bank Coalition of San Luis Obispo County that unites farmers, community volunteers, backyard gardeners, health advocates and food providers to harvest and donate excess produce into our local food system. 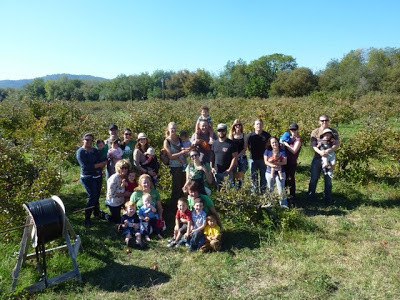 GleanSLO is always looking for volunteers, so check out their site to see how you can help with another glean in our community. Also, for any of you that do have backyard trees with excess fruit or a neighbor that does, GleanSLO has some drop sites in SLO that would welcome your fruit! Getting out in your neighborhood to talk with your neighbors is another great opportunity to involve your children in volunteering/sharing. For questions, please email gleanslo@slofoodbank.org.